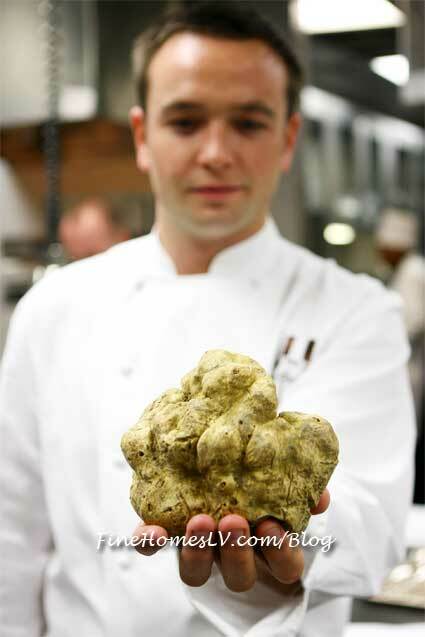 Dine and be delighted with the latest black truffle menu now available at Restaurant Guy Savoy inside Caesars Palace. This annual menu follows the huge success of Savoy’s white truffle menu, making the Michelin star restaurant stand apart by offering both black and white truffle menus when in season. The lavish eight-course menu is priced at $398 per person and will be available through February 2012. The Black Truffle Prestige menu includes phenomenal dishes starting with the mâche winter salad, followed by roasted turbot on the bone with black truffle and foie-gras with a black truffle bouillon. The fourth course consists of Savoy ’s famous and delicious artichoke and black truffle soup served aside a toasted mushroom brioche and black truffle butter. For the meat course, young chicken cooked inside an iron cast is served along with basmati rice and a foie-gras and black truffle sauce. A lentil and foie-gras plate precedes the brie and black truffle cheese course. The luxe menu concludes with a jasmine and chocolate dessert. For reservations, call 702-731-7110 or for more information. Caesars Palace welcomed Michelin three-star French chef Guy Savoy in May 2006 to its Augustus Tower, making this the famed chef’s sole U.S. restaurant. His coveted three Michelin stars are widely recognized as the pinnacle in culinary achievement. In 1997, he was honored with a “Guy Savoy” entry in the prestigious Larousse encyclopedia. In 2000 he received the Legion d’ Honneur – his country’s highest honor – from the French Minister of Agriculture, and, in 2009, was named “Officier” of the Legion d’Honneur. In 2002 Savoy was awarded his third Michelin star and voted “Chef of the Year” by his French peers. Since opening in May 2006, the Caesars Palace restaurant has received widespread critical acclaim including Esquire’s “Best New Restaurants,” and Gayot’s “Top 40 Restaurants in the U.S.” It earned 3 -1/2 stars from the Los Angeles Times while Newsweek International called it “the best restaurant in Las Vegas, and one of the finest anywhere.” In 2008, after only two years of operation, Restaurant Guy Savoy won the AAA Five Diamond Award and the Wine Spectator Grand Award.